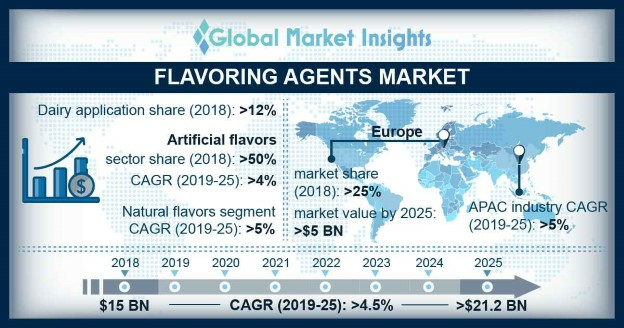 Flavoring Agents Market size is estimated to surpass USD 21.2 billion by 2025; according to a new research report by Global Market Insights, Inc.
Strong outlook in various applications sector including beverages, bakery, dairy, savory & convenience foods, confectionery, and meat is driving the flavoring agents market growth. Factors such as the increasing popularity of flavored soft drinks, a promising regulatory scenario for fortified products, along with increasing demand for organic products and clean product labeling are expected to fuel the product demand over the forecast timeframe. Europe flavoring agents market accounted over USD 5 billion by 2025. Growing consumption of Processed products such as acidified milk drinks, fruit beverages, yogurts and confectionery provide lucrative opportunities for the product penetration. Rising consumer awareness regarding consumption of food products prepared from natural ingredients will augment the regional demand.